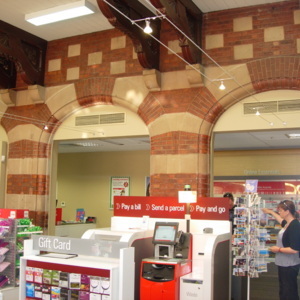 Australia Post, Byzantine, Lesley Gordon Corrie, William W. Eldridge, Free Romanesque, Launceston, Launceston Post Office, lead lighting, Alexander North, post office, quadrangle, Queen Anne Style, Romanesque, semi-circular arch, Tas, Tasmania. 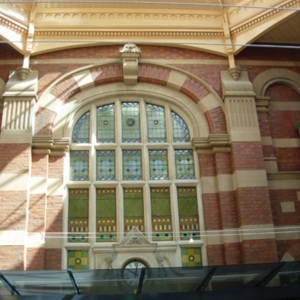 The Launceston Post Office is in the centre of the Tasmanian city of Launceston, and is one of four Heritage Property Showcase buildings of Australia Post for 2012. It was designed by architect William W. Eldridge (1850-1933) in 1885 with some alterations made by architects Lesley Gordon Corrie (1859-1918) and Alexander North (1858-1945) in 1890, the year the building opened. The red brick and freestone Post Office is in the Federation Queen Anne style, and incorporating elements of Free Romanesque. The Romanesque elements are obvious in the unusual interior which features an internal quadrangle (now glassed in) with balconies and windows. 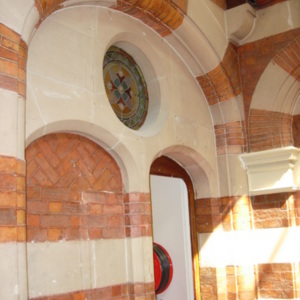 These elements include prominent use of semi-circular arches in the doorways and windows, and a pattern of alternating red brick and freestone, also known as ‘blood and bandage’, to highlight these features. The interior also includes leadlight windows. 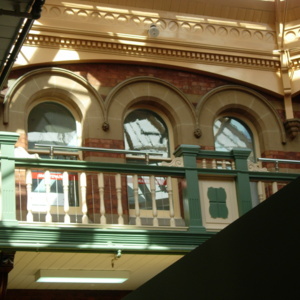 “Launceston Post Office interior, Launceston, Tasmania,” Medievalism in Australian Cultural Memory, accessed April 23, 2019, http://ausmed.arts.uwa.edu.au/items/show/1252.